As part of my wedding festivities my now in laws threw an entertainment know as the Noche de Novia or Moroccan Henna Party. 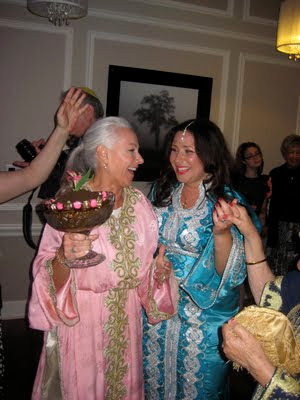 They are Spanish Moroccan and this is a very important party to celebrate the bride and do some Moroccan voodoo on the marriage and cast fertility spells on the couple or something like that. At least thats what our caterer Margie told me after the party. I was just so excited about the food and music and costume etc... I'll tell you more about the evening later on, I just wanted to post this pic of my mom and I holding the ceremonial henna. A lot of the people on my side of the family thought it was a bowl of chocolate pudding... LOL. I'm just glad nobody tried to eat it. Stay tuned.